Living a Fit and Full Life: Dream about the Plans God has for You with New NIV The Plans I Have for You Holy Bible by Amy Parker! Dream about the Plans God has for You with New NIV The Plans I Have for You Holy Bible by Amy Parker! 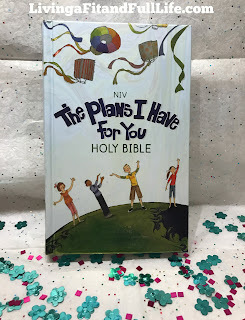 The NIV The Plans I Have for You Holy Bible is perfect for kids! I love that it teaches kids that God has a plan for them and that He's always looking out for them. I also love the 25 Promise Prayers pages that focus on children asking God to help them fulfill His plans for them. Another terrific feature of this Bible is the 100 highlighted verses, including God’s promises as well as hopeful and uplifting verses. These verses are perfect for kids to memorize and will stick with them to help them throughout the rest of their life. The NIV The Plans I Have for You Holy Bible also has a presentation page which makes it perfect for gifting. My kids and I absolutely love this Bible and adore the artwork throughout. 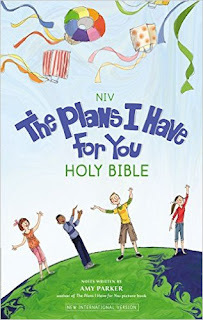 The NIV The Plans I Have for You Holy Bible is a great way to teach kids that God has a plan for them!